France is rich in clays... Pottery workshops abound... Master potters and ceramists throughout the region have preserved its traditional crafts..... the secrets of which have been handed down over the generations. 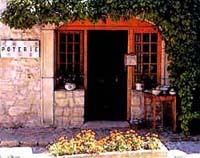 Poterie has been used for centuries for carrying, cooking, molding, and serving food as Uzes and small ateliers in the Var. Small figurines depicting provincial life symbolize the very essence of Provence.